The weather was heavy and low, pressing down on the city. The local Chimney Swifts — one two three four — came down from their usual empyrean heights to weave amongst the streets. They back-and-forthed right past the window, zooming and looping up and over the roof and/or down towards the street and over the roofs across the street. They alternate glides with vigorous wagging of their wings, which appear stiff. The back edges of their wings are ragged in comparison to the boomerang-smooth front. They are crazy fast, very erratic in flight, careening about the sky. It is difficult to count them in the air. Especially from the limited viewpoint of a window. We’ve been watching the swifts at the View From the Moraine for three summers now. It’s always a melancholy day in the fall when we realize they’re gone for the year. The silence lasts all winter. I’ve long suspected that the only industrial chimney I know about in the neighborhood might be a swift roost. It’s a long block away. 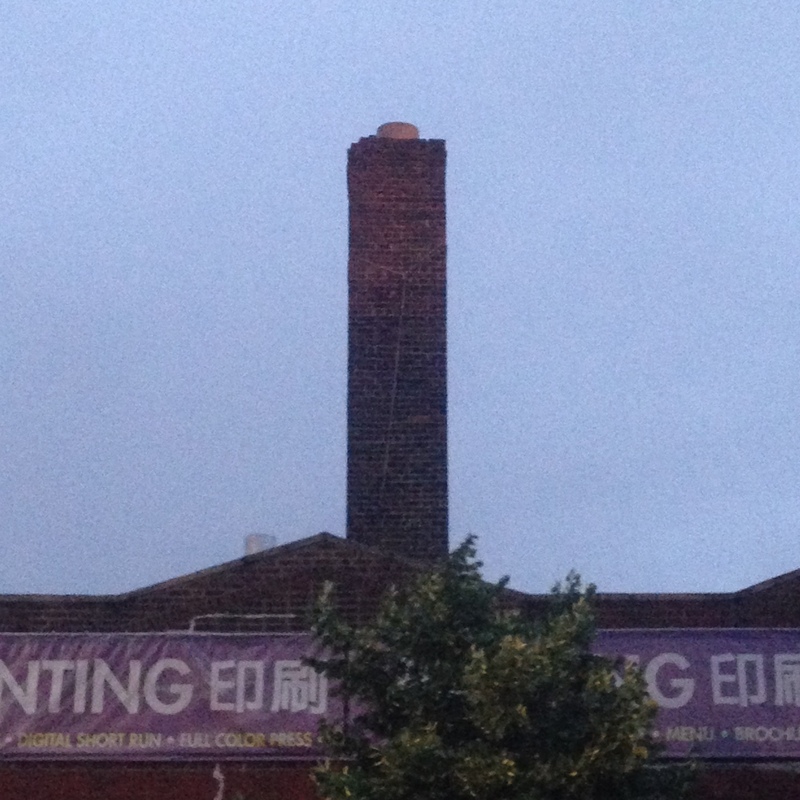 The building is a print shop now, with presumably no reason to use the chimney. Square, brick, atop a one-story building. There’s a funnel in its center, the chimney’s chimney. I finally went to take a look earlier this week. It was a drizzly night, but the swifts were out in the rain anyway. On previous evenings I’d noted them active at ten to fifteen minutes after sunset, so I was judging 8:30 p.m. to be a good time to observe. There were two swifts around the chimney, briefly. I watched for about ten minutes. And then one just dove right into the chimney. 8:27! I’d hoped to see more, but then urbanity intruded. The north side of this street is still mostly industrial. The south side is residential except for this corner print shop. The street is a bus and truck route. A shirtless man lurched into oncoming traffic down the street from the residential side, a car’s horn bringing him to my attention. He walked unevenly towards me. Oh-oh. Spider-senses tingling. But then he crossed back over to the other side of the street to lean against the print shop’s wall. I moved so that he couldn’t see me. Was he drunk, high, crazy, or some combination of these? Then two women walked by him and turned the corner onto the avenue. He followed them, entirely too closely, walking in a zigzag way. He rushed or jumped at them mid-block. One of them yelled and they either ran off or ducked into a store. I called 911 then. Will have to maintain another vigil for the swifts soon. Unfortunately, across the other corner is a fish store. Don’t want to hang out in that odor. Urban birding! ¡CARAMBA! I LOVED THIS PIECE.!!!!!!!!! Watched again tonight. Clear skies. Had maximum of six swifts over this intersection about 10 minutes past sunset. One swift dove into this chimney at 8:28, another at 8:31. No others. Waited six more minutes after last sight/sound of swifts in air.